Real Stability. Real Relationships. Real Rates. You can invest as little as $500 up to $1,000,000. The rate is determined by the note term, not your investment amount. You are not penalized for a smaller investment amount. There are no investment fees charged to you. 100% of your investment earns interest. You may choose monthly interest payments, or you may choose to have your interest be reinvested and compounded on a monthly basis. 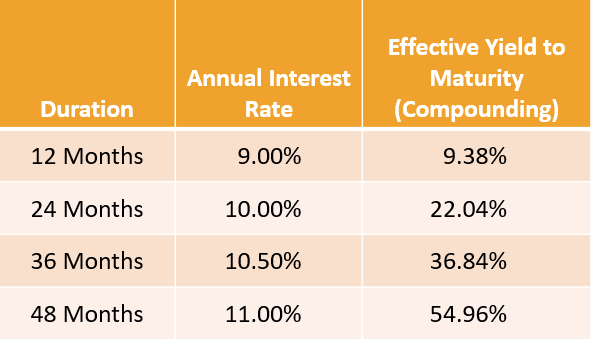 By allowing your interest to compound, a 7.0% annual yielding 48-month Note results in a yield to maturity of 32.21%. We will not issue checks or send ACH payments (except final payments) for less than $50, so amounts less than $50 will automatically compound monthly. All investors MUST read the Prospectus before investing. Questions? 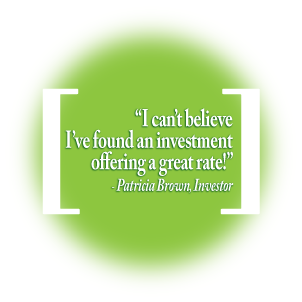 Please call us at (302) 752-2688 today, to discuss our investment process and to answer any questions you may have while deciding whether or out Notes are a good match for your investment goals.